Book Heart. Handcrafted. Custom design. Click "Design" to select color. 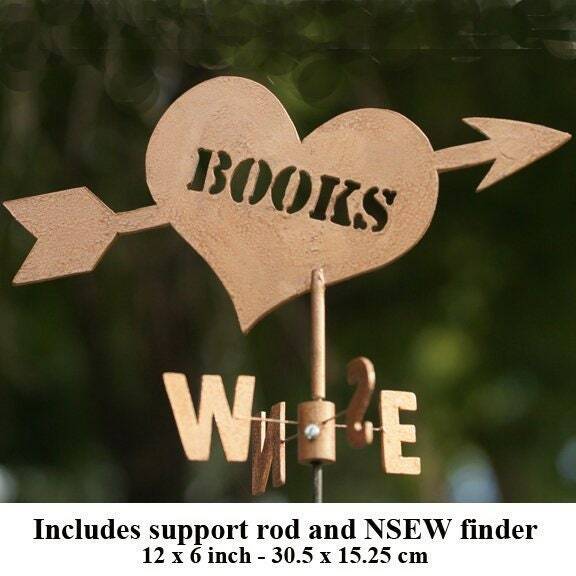 My Wee Weather Vanes are designed for little libraries and will delight friends and neighbors for years to come. 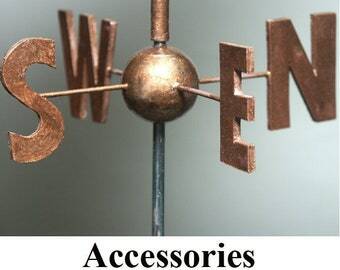 This real functioning weather vane is built to last, and designed to be highly sensitive to the slightest breeze. It is made of 1/8th inch thick (3mm) Sintra, a weather-proof rigid closed-cell homogeneous foamed board (PVC), and permanently coated with a Rust-oleum Hammered Copper Universal Metallic finish. The dimensions are on each individual vane's image. This order includes the adjustable-angle support rod and NSEW finder (seen in the "Accessories" listing)--all the parts for a complete Wee Weather Vane. Some assembly requiring a flat-blade and phillips screw drivers, and a drill are required. Instructions are included. Have a company logo, or unique idea for your own personal weathervane? Ask Terry for prices on custom vane designs. Handcrafted weather vanes. Custom design. Click "Design" to select design, color. Support rod, NSEW finder sold separate. See Accessories. Weather vane variety: Cat, Dragon, Witch. Support rod and NSEW included. Wonderful little weather vane. It adds so much whimsy to my little library. Highly recommend this seller. Very fast shipping. Book Heart. Handcrafted. Custom design. Click "Design" to select color. NSEW finder, support rod, sold separate. See Accessories. Perfect addition to the custom weather vane that I ordered.